Insulin pumps come in a variety of forms. Tethered and patch pumps are the options currently available on the NHS or to buy privately. At the moment, a new breed of extra intelligent insulin pumps (closed loop insulin pumps) are being tested under supervised conditions for research and could start to become available if the trials are successful. Tethered insulin pumps are those that have a length of flexible tubing between the pump itself and the cannula (the short, thin tube which goes through the skin). The pump itself, which usually feature controls, is free to be tucked into pockets or carried in pump pouches which can be worn under or outside of clothing. 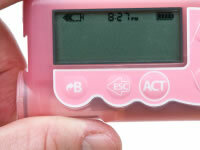 Some tethered pumps may also have controls on a separate handset which may also double up as a blood glucose monitor. A patch pump is where the pump is attached to the surface of the skin. To allow the pump to be as small as possible, the controls for the pump are located on remote control. The remote control may also serve as a blood glucose meter. One of the benefits of a patch pump is that there’s no tubing to catch on handles and other such objects but you may still need to be wary of where your pump is to prevent knocking or dislodging the pump. Currently, the mylife OmniPod is the only patch pump approved for use in the UK. An implanted insulin pump is a pump which remains inside the body at all times. An implanted insulin pump is able to deliver insulin into the peritoneal cavity which has a rich supply of blood vessels and can therefore absorb insulin very efficiently. Users of implanted insulin pumps have reported an improved sense of well being but there are a number practical disadvantages including the need for users to travel to Montepellier, France several times a year to have their pumps refilled. Implanted insulin pumps are rare and only a small number of patients worldwide use this kind of insulin pump. Closed loop insulin pumps, also commonly referred to as an ‘artificial pancreas’, are insulin pumps which are linked up to respond automatically to readings given by a continuous glucose monitor which also needs to be worn by the user through each day. A comprehensive set of rules and algorithms are required to respond to changes in blood glucose levels and ensure blood glucose levels stay within safe levels and to date these pumps are still in the research stage of development. It is likely to be a few years, if not more, before closed loop insulin pumps become available to a significant number of people with diabetes in the UK.